The bill to end subsidies and the requirement that power companies develop alternative energy sources that is working its way through a divided GOP in the state House has an interesting future ahead of it -- especially since the governor's commerce secretary is promoting a renewables conference. It squeaked through its first committee meeting Wednesday, and has an unusual three more committees to clear before going to the house. Then, if it gets that far, the bill faces an uncertain reception in the governor’s office. Recently, Gov. Pat McCrory told WRAL-TV that he is discussing the renewable energy portfolio law with his energy policy advisers and with the state’s environmental regulation agency. 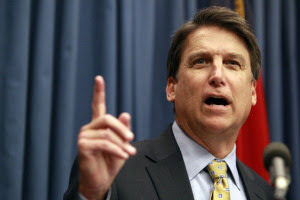 McCrory said the state needs to send a clear message to alternative energy investors, which is what opponents of Rep. Mike Hager’s HB298 say. It would be awkward if McCrory came out against renewable in light of the fact that his commerce department on Wednesday sent out a news release touting the 10th Sustainable Energy Conference later this month in Raleigh. Highlights of the conference include a Nobel Peace Prize winner, a leader of one of the state’s “most dynamic energy product innovaters,” the sustainability chief of one of the country’s top craft brewers, and the electric vehicle manager with Nissan LEAF in Tennessee.